Free for Free Edition, $12 for Basic Edition, $25 for Standard Edition and $75 for Professional Edition. 4 years 13 weeks ago. A problem with Zoho Discussions? When you look at Zoho Discussions at Zoho website, you see that Zoho Discussions is a small entry of the huge list of services provided by Zoho.com company. Even if this company holds an important list of different web applications, focus has clearly been put on the Zoho Discussions softwares, that is clearly a really modern and ergonomic application. You will discover in this review that AJAX and Web 2.0 common features have met for the real time bulletin boards, and that fusion is called Zoho Discussions. Please note that features that are not available on Free Edition are put as Plugin in the review. Those features could be enabled by using a Basic, Standard, Professional or Custom Edition of Zoho Discussions. Zoho Discussions is recommended for Large Community. Languages supported by Zoho Discussions. Some details about Zoho Discussions features regarding members. Convert an existing forum to Zoho Discussions. Does Zoho Discussions correctly follow (X)HTML and CSS norms? Nothing special to tell, instead that Zoho Discussions respects the norms, that is more and more common now, and that's a good news. Tags are really useful to organize and helps users to find what they need. Creation of new topics, that are classified by Discussion, Idea, Problem Reporting, Question Asking and Announcement are really good to help the user to organize his posts. 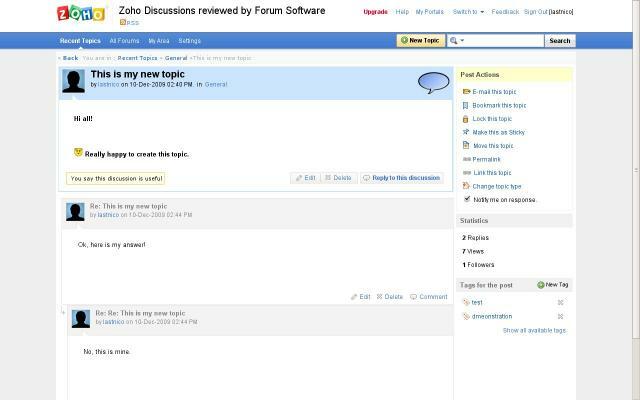 Zoho Discussions literally makes us rediscovering forum softwares. It was a real pleasure to discover and see how each features and advanced tips have been integrated in the general user interface. Of course, as usual with hosted forum solutions, you do not have any controls on your datas, and the datas of your community. That's the price of exporting infrastructure to the Web cloud. Indeed, when we are talking about services, it generally means commercial services, that signify that for advanced usage, you will have to pay something for what you need. Fortunately, prices that Zoho offers are quite good and are valid against their competitors. The navigation is really efficient and easy. The usage of AJAX replaces tons of useless pages by simple popups and dynamic reloading of some parts of the page. Moreover, it gives the feeling that the forum is much more fast than any classic forum software. No doubt on this, this forum software has been really well designed. To conclude, Zoho Discussions makes the bulletin boards entering to the Web 2.0 world. Experiment the Zoho Discussions Demo. Compare Zoho Discussions vs PhpBB 3 vs Simple Machines 2. Ask your questions to the Zoho Discussions Community Forum. Get Users Reviews about Zoho Discussions and Share your experience. I used Zoho Discussions as a university-level educator for 4 months from September to December in 2010. It was very user friendly overall and I'd give it a 7 out of 10. Good features included being able to identify your message as an idea, discussion, problem, etc., each color-coded with a symbol. It also has a clean look and good overall user experience of entering messages and attaching files and embedding images into posts, etc, nice interface. 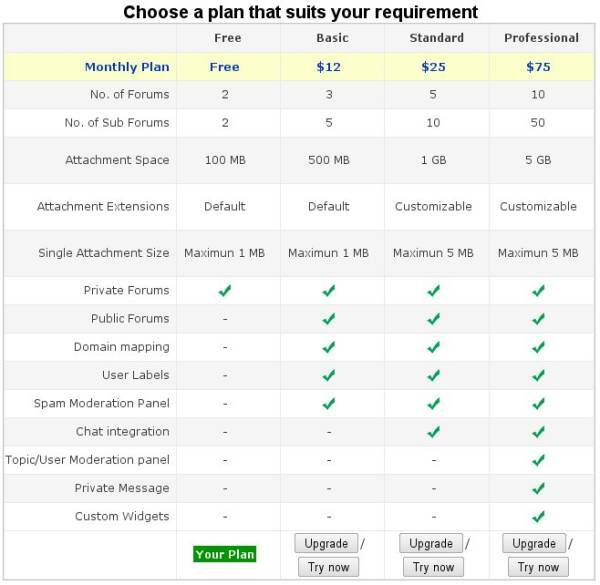 For the lowest paid plan, you can get 3 forums, public or private, and each has 5 subforums. The main problem I had was related to my use of it as a PRIVATE CLASSROOM forum (students in my class only). I had to send out invitations for each student and then manually delete students who dropped the course, which became too onerous for classes over 30 students large. I also had to encourage students to make usernames that were actually in line with their student names, since in a classroom you can't be anonymous or use a pseudonym. And they didn't always do this.